DBZ superfan Ben Wilson checks out the latest game in the big hair, high power, slow-mo reaction shot franchise. Every Dragon Ball game has the ever-difficult problem of differentiating itself from the many that came before. The series' beloved original story arc has been revisited and redone so many times that finding new ways to freshen it is a big challenge – hence the Xenoverse games. 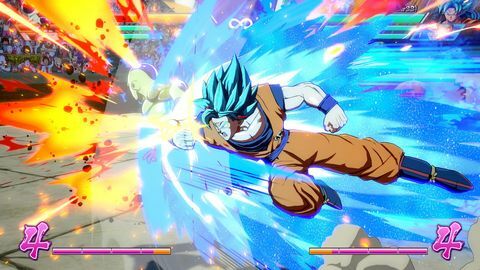 Dragon Ball FighterZ’s solution is something between an alternate-universe shake-up and a traditional retelling that repurposes Xenoverse's fighting system in a bid to appeal to the competitive scene. You won’t find another timeline rearrange here, but you will find a story which goes very much out of its way to recognise the player. There are now 21 androids, and FighterZ’s new villain concocts an elaborate plot that attempts to explain why all these characters suddenly can’t use their powers without ‘linking’ with a human soul (which is where you come in). She clones every major warrior for her own private army, which the game uses to reconcile a comparatively smaller roster of 22 fighters. The story could exist as one of the many DBZ movies, except that we are constantly reminded that the player as a ‘linked soul’ is someone the game's heroes and villains cannot fight without. It’s a framing device that's awkward and unnecessary. Xenoverse used character creation to help players feel personally involved, but there it made sense because you were a third party previously unbeknownst to the Z Fighters, so your existence and personal participation were not hard to swallow. Here, the participation of the player as an abstract and disembodied spirit within the story is contrived and cumbersome. When FighterZ isn’t concerning itself with ludonarrative justifications, there’s a story filled with many ‘in-between’ moments of brilliant character interaction. When the characters are not pummelling each other, everyone is generally conversing. Dragon Ball games usually offer either paraphrased summaries from the show or basic projections of their characters. However, FighterZ is on the same level of comedic awareness as Dragon Ball Super, or is perhaps even a level above. The dialogue is playfully inspired. Ever wondered how Gotenks should address Goku and Vegeta when both are his father and both are not at same time? Has Goku even thought about it? What does Vegeta think? Does he even care? Those are the kind of conversations this game loves. The characters aren’t just cutscene translations of their anime selves – they’re insightfully and refreshingly expanded by inventive writing. However, this is still a fighting game not a visual novel, so people can’t be talking forever. Battle-wise, FighterZ is an accessible interpretation of the competitive fighting genre, akin to something like the Injustice series. Everything you can do can be learned in 30 minutes, and every character's moves have roughly the same button combinations. As it often is with easier setups, the timing and use of those abilities is the difference between simple knowledge and mastery, and those are the nuances this game depends on to retain its appeal and a community. I took a friend through some bouts on local battle. While he was routinely flattened, he had learned almost everything he possibly could – every physical attack, every all-encompassing kamehameha. This is no Street Fighter where complex combinations are required for super moves. But while Dragon Ball FighterZ may not grant satisfaction via input difficulty, it is satisfying knowing pretty much everyone can do the moves you can. Dragon Ball FighterZ is evidently trying to play into the competitive scene. Is it any coincidence the lobby is set in the World Tournament, a place where fighters the world over would come to test their skills against each other? Perhaps superfluously, there are three ways you can find someone to fight: emanating the equivalent of a multiplayer mating-call to whichever wandering soul likes the look of you, matchmaking with other people in the lobby, or matchmaking with anybody anywhere else. As you'd expect, these online fights are much tenser than the game's campaign mode – no one is standing idle because their programing is telling them to be less aggressive. Instead, players come at you relentlessly, trying to avoid giving you any opportunity for counterattack. This is where the combat system benefits those with an eye for the smaller details and the diligence for practice. The lobby also functions as the hub world, as well as the main menu. It’s a neat integrative idea, but it’s also unfortunate – I haven’t played many games where losing connection with the main menu is an ever-present danger, but that's something that was a frequent occurrence when I first fired up FighterZ. Patch 1.03 seems to have eased this problem, but it’s still there in some measure at time of writing. Dragon Ball games are one of those things we’ll probably see for the foreseeable forever, and being a starry-eyed fan, I’m not adverse to the idea and love seeing what interpretation will come next. What has arrived this time is a tactical Dragon Ball fighter of high pedigree. 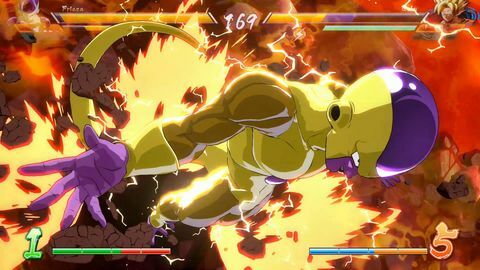 We’ve had many DBZ action games, but none that required the the skill and competitive spirit of titles we’re more frequently seeing in the spotlight of esports. That might well change with this release. Editors Note: We've recently spent a bunch of time with the Nintendo Switch version of Dragon Ball FighterZ and are happy to report that it makes the transition incredibly well. Graphically the game looks superb in both handheld and docked mode. Characters in the background during cutscenes tend to look very pixelated but this has absolutely no impact on the gameplay. Matches play out at the same lightning fast pace seen on the PS4 and Xbox One versions. I've so far sunk about 35 hours into it and am going to go straight back for more battles after this. If you're after a great fighting game on the Nintendo Switch to tide you over until Super Smash Bros. 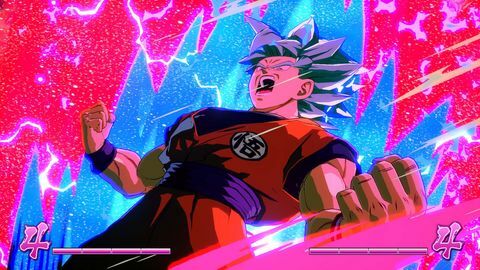 Ultimate, you can't go wrong with Dragon Ball FighterZ. It's so far been some of the best multiplayer fun I've had with the Switch yet. Ups The banter between old friends and enemies as they fight is great. It's very accessible, so expect plenty of mega blasts. Downs The main menu's online connection is tenuous. The narrative framing is clumsy and unnecessary.